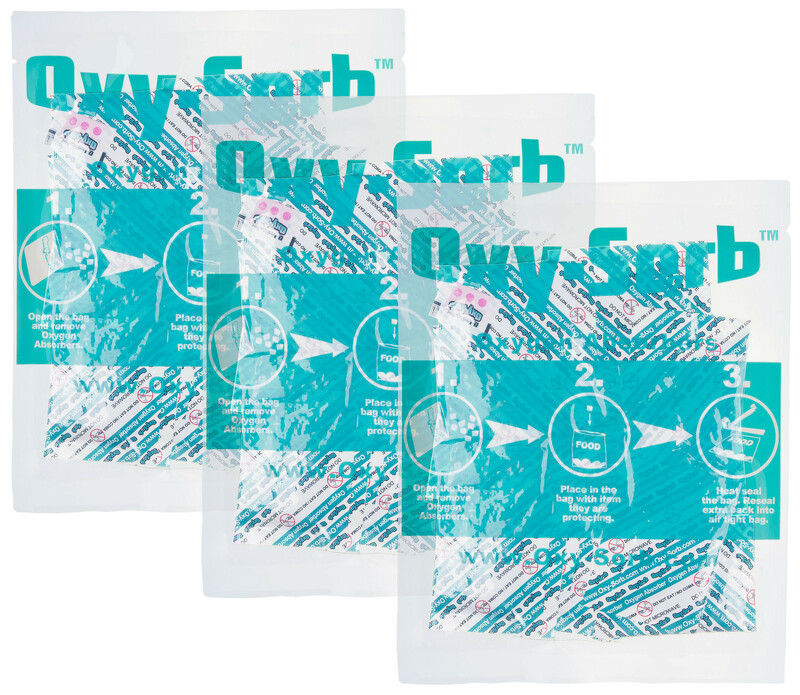 Oxy-Sorb brand Oxygen absorbers conveniently prepacked into packs of 20. Three packs included for a total of 60 absorbers. One 300cc Oxygen absorber should effectively cover up to 1 gallon of space. Oxy-Sorb brings you the best in freshness. Tired of having to purchase large packages of Oxygen Absorbers and always seem to be wasting a few? That is where this set comes in. Included are three packs of twenty Oxygen absorbers for a total of sixty absorbers. This is a much more manageable solution for most household applications. Each pack has a freshness pill inside so that there is no question as to the quality and freshness of these absorbers. If the pill is red, then no Oxygen is present, and they are good to go. If the pill has turned blue it means the bag has been compromised and Oxygen has gotten in and the absorbers are no longer good. Our Oxygen absorbers are made of a chemical compound, the active ingredient of which is powdered iron oxide. While they are not edible, they are not toxic either and are completely safe. No harmful by product gases are created, and they do not remove the fresh smell and taste of the product. Our absorbers reliably bring the Oxygen level down to .01% or less when used in proper packaging. They extend shelf life by preventing growth of aerobic pathogens, and spoilage organisms, including molds. They eliminate the need for additives such as BHA, BHT, sulfur dioxide, sorbets, benzoates, etc. Other benefits include: Helps retain fresh-roasted flavor of coffee and nuts. Prevents oxidation of spice oleoresins present in spices themselves and in seasoned foods. Prevents oxidation of vitamins A, C and E Extends life of pharmaceuticals. Inhibits mold in natural cheeses and other fermented dairy products. Delays non-enzymatic browning of fruits and some vegetables. Inhibits oxidation and condensation of red pigments of most berries and sauces. One 300cc Oxygen absorber should effectively cover up to 1 gallon of space. Each absorber measures 2.95" x 2.17" x 0.11". Each pack of 20 measures 9.25" x 7.25" x 0.19". Overall packaged set dimensions are 9.50" x 7.75" x 1.10".